1.2 What contraindications do chickpeas present? 1.5 Who should not eat chickpeas? 1.6 Eating chickpeas in case of diarrhea? 1.9 Can you eat chickpeas if there are gastritis or ulcers? 1.10 Can chickpeas be given to babies? 1.11 Can people with diabetes eat chickpeas? What contraindications do chickpeas present? 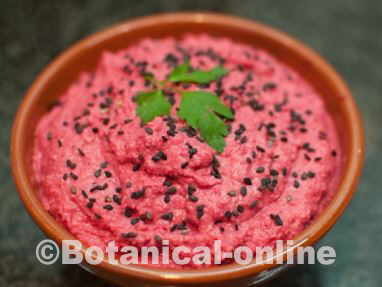 Chickpeas are very nutritious vegetables because they contain a lot of protein. In addition they have a very high nutritional value for their contribution in vitamins B and minerals (potassium, phosphorus, magnesium , calcium, iron and zinc). Although they are a very natural and healthy food for most people, they may have certain contraindications. To eat a little quantity and increase progressively: the chickpeas can produce annoyances or gases as a side effect of their ingestion, since they contain oligosaccharides, that are highly fermentables fibers. As we get used to digesting these types of fibers, the intestinal flora adapts and symptoms decrease. Soak to remove their antinutrients (saponins, protease inhibitors, amylase inhibitors, phytates, etc.). These substances produce bad digestions since they prevent the complete digestion of the legumes. Do not cook with too much fat. highfat foods such as sausages and other processed meats produce much slower digestion. In case of frequent discomfort or pain, consult a doctor. Chickpeas, like all other legumes, except sprouts, should not be eaten raw. 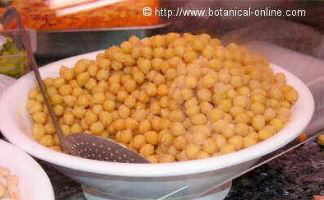 Raw chickpeas contain toxins that are removed after being soaked and boiled in plenty of water. Ingestion of cakes made with chickpea flour cooked in the oven without water may be responsible for cases of neurolatirism. Who should not eat chickpeas? Gout or high uric acid: They should be consumed in less quantity in case of problems of hyperuricemia or gouty disease, due to the purine content of these foods. Allergy: Although chickpeas are gluten-free, they may have been processed in factories using gluten-free cereals. In case of allergy, it is recommended to consult the label. Also people with allergies to this food or other legumes (soy, peas, lentils, …), nuts or seeds can not eat chickpeas , for the same reason. Eating chickpeas in case of diarrhea? It is not appropriate to eat chickpeas when there is diarrhea or gastroenteritis, situations in which a diet based on rice water, carrots, potatoes, apples, and other more digestive and better tolerated foods is recommended (see diet for diarrhea). Intestinal diseases: Consumption of this food is not recommended in people with Crohn’s disease, colitis and irritable bowel because of its high fiber content. Some dietitians advise against them in these cases, just as when one suspects that there may be a leaky gut, because of the irritating effect of the saponins on the digestive tract. This restriction is usually temporary to improve digestive health. FODMAP diet: People who follow a diet low in FODMAPs should eliminate the group of legumes, among which are chickpeas. Generally this diet is used for the treatment of digestive diseases mentioned above. Low potassium diets: chickpeas are not suitable, like all legumes, for people who need to reduce the amount of potassium in their diet, such as kidney failure, nephrotic syndrome, or kidney disease. One of the main dangers of eating chickpeas are the possible toxins that originate their poor conservation. Can you eat chickpeas if there are gastritis or ulcers? Yes, you can eat chickpeas in case of gastritis and ulcer, but they must be cooked properly and it is recommended to take in smaller quantity than usual. Can chickpeas be given to babies? Chickpeas, along with lentils, chickpeas are the first legumes given to babies, but their introduction must be very slow and careful. It is recommended to introduce them in very little amounts and adequately prepared. For children, it is an excellent, nutritious and energetic food. Can people with diabetes eat chickpeas? Yes, diabetics can eat chickpeas because they are also a very nutritious and adequate food to improve their disease. But be aware, there are a number of recommendations, especially if you take insulin.